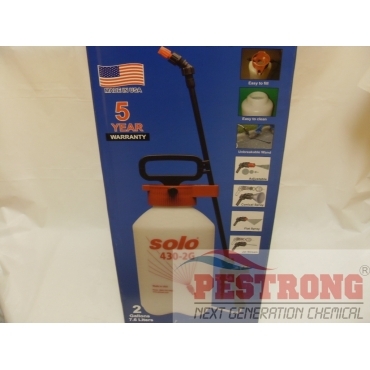 Where to Buy Solo Handheld Sprayer, Solo 430-2G Handheld Sprayer 2 Gallon - $38.25 for Sale with Fast Free Shipping! Solo 430-2G Handheld Sprayer 2 Gallon is professional sprayer for virtually every spraying requirement. Newly designed mid-price range sprayer incorporating a large filler opening and the popular funnel top concept. 430-2G has all Viton seals, long hose, large pump handle and loads of other useful features. Adjustable Nozzle for spraying a steam to a mist; Flat Fan Nozzle for area and row application; Hollow Cone Nozzle for shrubs and bushes; and Jet Stream Nozzle for additional reach. The ideal 2 gallon sprayer for virtually every spraying requirement. Fantastic sprayer for a great price! It's made of nice materials and it's lightweight. Obviously once it's filled up, it's heavy, but not unbearably so. It's still comfortable to carry and it's easy to carry and spray at the same time.